Here is one of the finest and most talented painters of Lower Normandy! 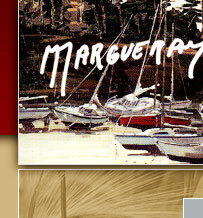 Michel MARGUERAY was born in Calvados and has been practising his art for many years. He is an accomplished artist whose works I first saw in Rouen as early as 1974. Undoubtedly figurative, Michel Margueray respects reality without remaining subordinate to it, painting it with an infinite amount of sensitivity and personality. As a landscape painter, he expertly depicts skies with much emotion and energy, thereby underlining the lively and harmonious nature of the sites. Time, climate and light combine to form a whole that demonstrates the painter's skills as a great colourist. It is impossible to conclude without mentioning Michel MARGUERAY's flare for drawing perspectives that he judiciously chooses to extol the beauty of the landscapes. The elements, vegetation and characters extol as much the artistic profession as they do the curiosity for the unusual, and the generous nature of the atmospheres. More than a pointer of seascapes, Michel Margueray is a pointer of water. The forever mobile, mirror-like surface of this sovereign element fires in him an impetuous quest for clarity of which each o fhis canvases is a benign illustration. His colors sing and even the snow is bedecked in a thousand nuances. Astonishing shapes emerge from his sbadows. The quest for light is visible in tbe flutterings of the dawn and the glow of tbe evening. Michel Margueray is an artist whose strength of character and pictorial charisma allow him to express in his paintings his love of nature, his passion for forms and his will to demonstrate the poetic transcription, the interpretation of his daily observations. Seascapes or landscapes, Margueray's works bear that power of evocation that sublimates reality by providing it with an authenticity that goes straight to the heart. The Normandy-born Margueray' love of the sea and taste for wide-open spaces and discovery transform his canvases into sensitive testimony of his pictorial wanderings. With rigorous feel, highly elaborate draftsmanship and well-structured compositions, Margyueray demonstrates in each canvas, whatever its dimension or theme, the feelings and emotions his subject inspired. This is why a monograph dedicated to the painted works of this talented artist had become indispensable. The quality of bis oeuvre, the special light that floods his paintings, his magnificent interpretation of reality observed, make of Margueray an artist whose work has satisfied the most difficult of collectors and art-lovers over the years. Michel Margueray is, in fact, an artist who does not like to show himself much, who prefers to work in his studio rather than be seen at social events. He likes to paint non-stop and new subjects are always on his mind. Every vision, every detail grasped is a fresh occasion for self-expression and for our greatest pleasure, self-revelation. Margueray is like a reporter of everyday life. He expresses himself by showing us simple but grandiose events of day-to-day life or if nature, making us rediscover what we thought we already knew, drawing our attention on forgotten details or scenes that we simply look through. For this artist whose every show is a source of wonder, art is first of all a way of communicating, of opening up to people. It wou? ?ld be impossible to conclude without rendering homage to his wife Monique who is of great help thanks to her support and the happiness she brings him. May the readers of this book take as much pleasure reading about Margueray's paintings as he does in executing them. In these cruel, aggressive and terrible times, it is a pleasure to find an artist who loves and interprets the stuff of dreams through calm, restful and welcoming nature. Michel Margueray's expression is solidly in its serenity: we like, we assure,we're reasured ! And enchanted.